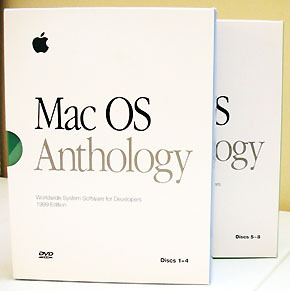 Introduced on the stage by Steve Jobs during the May 1999 WWDC Keynote, the “Mac OS Anthology” was a collection of many Mac OS operating systems to aid (registered) third party developers in testing their software for compatibility. It was presented originally in the form of a boxset of 4 DVDs which included all of the releases of the Macintosh operating systems since System 7 ’til the current one which at the time was Mac OS 8.5. The DVDs were chosen for their archival capacity and featured all of the international localizations of the systems, up to 25 languages. From an archived copy of the Apple website we also know the sale price: 199 USD, and just 149 for those ADC members who ordered a copy before May 14. In 2000 the price was discounted to just 99 dollars. Later, in February of 2000 Apple offered to ADC developers two more volumes for Mac OS 9 (in 15 languages) collecting the other four in a new, second boxset labeled “2000 edition”. 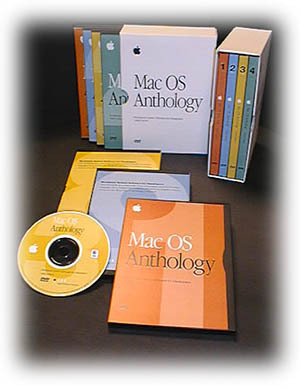 After that, in 2001, the Mac OS Anthology again grew to include two more DVDs. These were to be the last additions, featuring Mac OS 9.0.4, 9.1 and the first Mac OS X and brought the grand total to 10 discs.